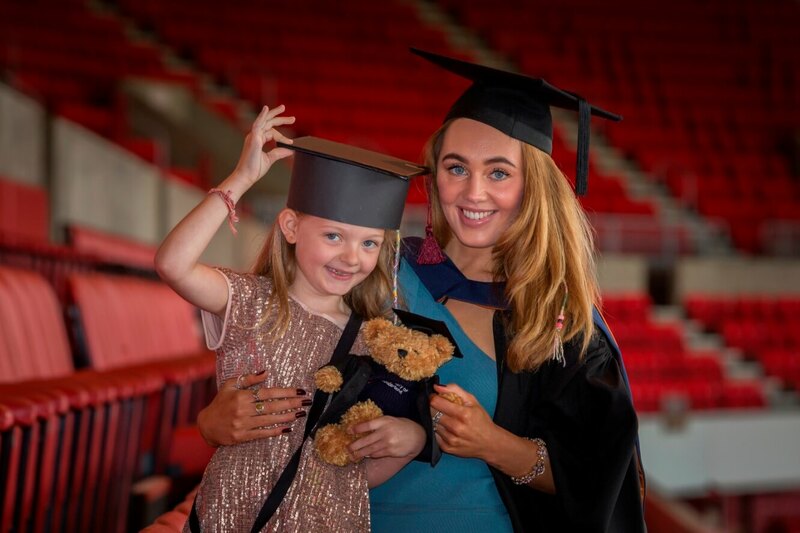 Studying at the University of Sunderland opened up an unexpected career path for young mother Siobhan Walker – even before she graduated she found herself working for a professional racing driver. Siobhan, who graduated this week with a First Class degree in Sports and Exercise Sciences, originally left education with no intention of coming to university. When she fell pregnant at 19 she suffered from scoliosis - curvature of the spine – and working with physiotherapists convinced Siobhan that she would like to pursue a career in personal training and physiotherapy. Now, aged 27, Siobhan has begun her career as Personal Advisor to professional racing driver Reece Barr. She landed the role almost a year ago while still studying at Sunderland – and her road to an exciting new career began with what many would consider a serious setback. Siobhan, originally from Skipton in North Yorkshire, said: “When my daughter Kaitlin was born I was like a blown over tree! I thought if physiotherapy can help me, maybe I can do that for other people. Professional racing driver Reece Barr, who competes in the JCW BMW mini series, approached the University’s Sport Sciences team to help support him with his fitness, stamina and concentration. Academics immediately turned to Siobhan, as they recognised that her expertise in personal training and sports massage, and her studies in sports nutrition, would be an ideal fit for the young driver’s fitness needs. “You’d think he would simply have to sit there and drive, but to be successful at that level you have to be very fit in both your body and mind, and also deal with the impact that driving has on your body. The racing team were so impressed with Siobhan’s support that in 2016 she was appointed Personal Advisor to driver Reece Barr – and to cap her triumphant year, Siobhan will graduate with a First Class degree in Sports and Exercise Sciences. Siobhan added: “When Kaitlin was born it was like a rebirth for me, and I started to think about who I was and what I wanted out of life. It’s crazy to think that having a baby would make you think about going into education, but I wanted to do something for me.